plus anything else that strikes my fancy! Promote your Sangha or business website using targeted keywords in the Coffeehouse. You can target your Google Ad to appear in this high traffic website as a whole or to focus on one URL or directory. All buddhist webpages (and some others) are welcome to request their addition to this site. Email Don at Lotus -at- classes.bz. Put online today the Myohorenge Dharani Kyo an adaptation of Reiyukai's Darani Kyo using the transliteration found in Nichiren Shu's Myohorengekyo Yohon. Reciting this Darani Kyo is the primary supporting practice of many Reiyukai members. It is secondary only to reciting the Blue Sutra, which includes portions of ten chapters of the Threefold Lotus Sutra but is recited in one's own language. Give Ryuei's listing of Mahayana Sutra Commentaries a facelift. Ryuei updated the text for his chapter on the Life of the Buddha and Don gave the page a facelift. Asked to add a link to this interesting website in the Coffeehouse: Bruderhof Peace Barn - A September 11 memorial and more in Pennsylvania. This evening I added links to the first Nichiren Shoshu website in Argentina. Here is the advertisement I received today: A cordial greeting from EL BUDISMO.com.ar I present the first version to you of the argentine site dedicated to spread the True Buddhism of Nichiren Shoshu. A site in benefit of the Kosen Rufu of the whole world. This site was developed for believers and not believers of the True Buddhism of Nichiren Shoshu. So it is dedicated to transmit and to orientate persons (believers and not believers) towards a wide description and an introduction of the Buddhism. It possesses a wide scale of important topics of the Buddhism, as Nichiren Daishonin´s life, Atsuhara´s pursuit, about the Buddhists Gods, a great section dedicated specially to the Karma´s explanation, etc. It also counts with a forum where you will be able to take part, to criticize or to encourage the believers and not believers that nowadays had taken part of the Buddhism. Dharmajim finished visit three in Good Dharma Friends Discuss the Lotus Sutra which explores Vajrayana and how the Lotus Sutra is superior to Esoteric Buddhism. Redesign this What's New webpage and (long overdue) create a new page for my 2004 Coffeehouse Updates. Nichiren's Coffeehouse continues to average about 1200 page views a day and our top three Google search queries for August were: (1) miyako; (2) Ikeda Peace Park; and (3) President Ikeda. Updated the Tendai Shu links for North Carolina, Germany and Denmark. 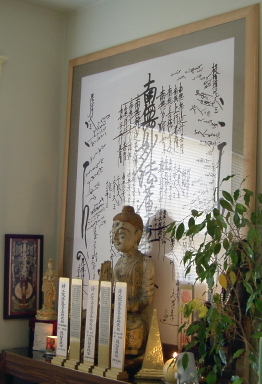 Dharmajim changed the name and address of his Sutra Salon Y!Group today to Dharma-House. Don updated the Coffeehouse and Dharmajim's website Dharma-House.org to reflect this change. Should One Refrain from Arguing the Dharma? The Question of Nationalism Part 1: Should the Dharma Serve the State? The Question of Nationalism Part 2: Should the State Serve the Dharma? Have the Gods Abandoned Japan? Added the second chapter of Dharmajim's delightful, new Two Good Friends Discuss the Lotus Sutra in a Coffeehouse comparing the Middle Length Discourses with the Lotus Sutra. Develop my new webpages for and advertise Vesona: a Universal Language constructed by Dr. Sivartha in the 19th century. Change the name yet again for my Ring of Christianity, broadening its scope and playing off of the original meaning of my ancestor's penname, Alesha Sivartha, who wrote extensively on the Bible. The ring's new name is . Sivartha d'Mashicha is early Aramaic for Good News of Messiah, the Messiah in us all. Added the first chapter of Dharmajim's delightful, new Two Good Friends Discuss the Lotus Sutra in a Coffeehouse comparing the Middle Length Discourses with the Lotus Sutra. Put online my new Forward for Whispers With Sivartha called A Tale of Transmigration sharing my inner journey and inspiration for The Book of Life spanning three centuries, three continents, and three lifetimes. Discover a new japanese language site that joined one of my rings today and added them to my Kempon Hokke webpage: Kempon.net. Finish putting online today one of my life long dreams, all 85+ fascinating drawings (mostly anatomy and mind maps) from The Book of Life: The Spiritual and Physical Constitution of Man (7th ed., 1912, 2004) written by my great-great-grandfather, Dr. Alesha Sivartha, one of the grandfathers the "New Age" Movement in the late 19th century. Renamed my generic ring An Interfaith WebRing for Peace in the Middle East to and added his artwork as the new logo. Renamed my Ring of Christianity to and added his artwork as the new logo. Added the new Rissho Kosei-kai website for Sacramento : www.Andromedia.name to my Worldwide Directory. Updated my Worldwide Directory with the address for the new HQ of Reiyukai America. They have now moved out of their old Gardena bldg and have moved into the heart of Pasadena's Old Town where they welcome walk-in traffic. Speaking of Reiyukai... they continue to be very supportive of me, my new business, and public health in general by allowing weekly CPR and First Aid classes in their San Diego office. Thank you, Reiyukai! Don added the new website for NichirenShuFlorida.org and their Tampa Bay Sangha to his Worldwide Directory. Pia updated Ryuei's homepage and Overview of Buddhism. Changed the name of my WebRing to . All sites by or about buddhist women are invited to join! Added the new website for HokkeShoshu.com to my European Directory of Lotus Sutra Schools. In their own words (posted today in the Independent Sangha): It is a native Italian Nichiren (shoretsu) School founded by the Italian Monk Nichiken. Adopted a new WebRing today, this one for . Pia put online three new webpages for Ryuei.net, grouping Ryuei's study pages by theme: Pali Canon Commentaries, Mahayana Sutra Studies, and Lotus Sutra Commentaries. She also updated his How to Read Ryuei.net to reflect these changes. His latest chapter (26) from his commentary on the Rissho Ankoku Ron: Should One Refrain from Arguing the Dharma? Updated my links to the only english page of which I am aware for Fujisan Honmonji, the head temple of Honmon Shoshu, Taisekiji's ancient rival and neighbor near the foot of Mount Fuji: HonmonShoshu.fujimon.org. The old tripod site is no more. Ryuei's Essays received 10,530 hits this month! Updated the link for SGI members in Central Oahu from BuddhistHawaii.com to PeelmanHawaii.homestead.com. Adopted a WebRing for . OptiWell held its first CPR class at Reiyukai San Diego open to the community. Attended by local nurses and child care providers. Adopted the and renamed it . Features a quaint family history written by my forebears in post-Civil War South Carolina 1890. Attended Reiyukai's monthly service in San Diego. Great food, as usual. They celebrated Setsubun, a japanese tradition where those born in Year of the Dragon (like this year) throw soy beans at the others saying (in japanese) and laughing "Demons out! Blessings in!" Added ShortFormTientai.com to my Tendai Buddhism webpage. This month of January, my webpages and WebRings received 97,924 hits, which is an average of 3,158 hits/day. It looks like Nichiren's Coffeehouse is on track to receive ONE MILLION visits this year! Added the contact info for Nichiren Shu in Taiwan to the Coffeehouse, as they continue to spread throughout Southeast Asia. First Aid & CPR for the Latino Community introduces local first aid and CPR classes in spanish by Lucila Ochoa. An OptiWell press release for San Diego's Job Giant. Updated my worldwide directory (courtesy of Samuel Hue of Singapore) with current contact info for the Nichiren Shu missions in South East Asia: Indonesia, Malaysia and Singapore. Advertising | Buddhas | Discuss | Gohonzon | Gosho | HBS | Independents | Inmates | Kempon | Kishimojin | Lotus Sutra | Nichiren | Nichiren-Shoshu | Nichiren-Shu | Nipponzan-Myohoji | Pilgrimage | Pure Land | Queers | Rissho-Kosei-kai | Reiyukai | Ryuei & Dharmajim | SGI | Stupas | Sutra Library | Tales | Tantric | Tendai | Theravada | WebRings | Women in Buddhism | Zen | Misc. | What'sNew?